Totally automate your optimization process based on accurate campaign analytics, using rule based optimization actions and more. Forget about chaotic spreadsheets! Automatically block money-draining publishers based on individual publisher performance. Got a publisher blocked by rules but the conversion fired with delay? Create a Start Publisher rule to automatically unblock profitable publishers even when you sleep. Not sure how TheOptimizer Mobile can help you? 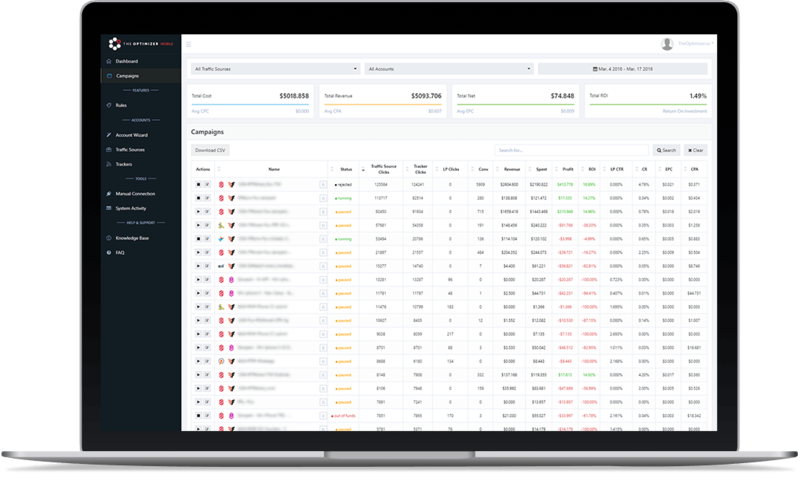 Our platform offers support to all major tracking platforms used in the performance marketing industry like Voluum, ThriveTracker, FunnelFlux, Binom, Bemob, AdsBridge, RedTrack. It is TheOptimizer.io’s policy to respect your privacy regarding any information we may collect while operating our websites. Like most website operators, TheOptimizer.io collects non-personally-identifying information of the sort that web browsers and servers typically make available, such as the browser type, language preference, referring site, and the date and time of each visitor request. TheOptimizer.io’s purpose in collecting non-personally identifying information is to better understand how TheOptimizer.io’s visitors use its website and to better provide related content to its visitors. From time to time, TheOptimizer.io may release non-personally-identifying information in the aggregate, e.g., by publishing a report on trends in the usage of its website. TheOptimizer.io also collects potentially personally-identifying information like Internet Protocol (IP) addresses for logged in users. TheOptimizer.io only discloses logged in user IP addresses under the same circumstances that it uses and discloses personally-identifying information as described below. Certain visitors to TheOptimizer.io’s websites choose to interact with TheOptimizer.io in ways that require TheOptimizer.io to gather personally-identifying information. The amount and type of information that TheOptimizer.io gathers depends on the nature of the interaction. For example, we ask visitors who sign up for an account at https://TheOptimizer.io.io to provide a name and email address. Those who engage in transactions with TheOptimizer.io – by purchasing access to the TheOptimizer.io paid service, for example – are asked to provide additional information, including as necessary the personal and financial information required to process those transactions. In each case, TheOptimizer.io collects such information only insofar as is necessary or appropriate to fulfill the purpose of the visitor’s interaction with TheOptimizer.io. TheOptimizer.io does not disclose personally-identifying information other than as described below. And visitors can always refuse to supply personally-identifying information, with the caveat that it may prevent them from engaging in certain website-related activities. TheOptimizer.io may collect statistics about the behavior of visitors to its websites. TheOptimizer.io discloses potentially personally-identifying and personally-identifying information only to those of its employees, contractors and affiliated organizations that (i) need to know that information in order to process it on TheOptimizer.io’s behalf or to provide services available at TheOptimizer.io’s websites, and (ii) that have agreed not to disclose it to others. Some of those employees, contractors and affiliated organizations may be located outside of your home country; by using TheOptimizer.io’s websites, you consent to the transfer of such information to them. TheOptimizer.io will not rent or sell potentially personally-identifying and personally-identifying information to anyone. Other than to its employees, contractors and affiliated organizations, as described above, TheOptimizer.io discloses potentially personally-identifying and personally-identifying information only in response to a subpoena, court order or other governmental request, or when TheOptimizer.io believes in good faith that disclosure is reasonably necessary to protect the property or rights of TheOptimizer.io, third parties or the public at large. If you are a registered user of a TheOptimizer.io website and have supplied your email address, TheOptimizer.io may occasionally send you an email to tell you about new features, solicit your feedback, or just keep you up to date with what’s going on with TheOptimizer.io and our products. If you send us a request (for example via a support email or via one of our feedback mechanisms), we reserve the right to publish it in order to help us clarify or respond to your request or to help us support other users. TheOptimizer.io takes all measures reasonably necessary to protect against the unauthorized access, use, alteration or destruction of potentially personally-identifying and personally-identifying information. If TheOptimizer.io, or substantially all of its assets were acquired, or in the unlikely event that TheOptimizer.io goes out of business or enters bankruptcy, user information would be one of the assets that is transferred or acquired by a third party. You acknowledge that such transfers may occur, and that any acquirer of TheOptimizer.io may continue to use your personal information as set forth in this policy. 1. THIS SOFTWARE SERVICES AGREEMENT (the “Agreement”) is entered into and effective as of the day you “AGREE” (the “Effective Date”) by and between TheOptimizer.io and you or the company or entity you represent, (“Client” or “You”). PLEASE SCROLL DOWN AND READ ALL OF THE FOLLOWING TERMS AND CONDITIONS OF THIS AGREEMENT CAREFULLY BEFORE CLICKING AN “AGREE” OR SIMILAR BUTTON OR INSTALLING OR USING THE SOFTWARE SERVICES (DEFINED BELOW). THIS AGREEMENT IS A LEGALLY BINDING CONTRACT BETWEEN YOU AND TheOptimizer.io AND SETS FORTH THE TERMS AND CONDITIONS THAT GOVERN YOUR USE OF THE SOFTWARE SERVICES. 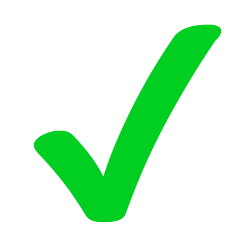 BY CLICKING AN “AGREE” OR SIMILAR BUTTON OR BY USING THE SOFTWARE SERVICES, YOU ACCEPT AND AGREE TO ABIDE BY THESE TERMS AND CONDITIONS AS PRESENTED TO YOU – ANY CHANGES, ADDITIONS OR DELETIONS BY YOU TO THESE TERMS AND CONDITIONS WILL NOT BE ACCEPTED BY TheOptimizer.io AND WILL NOT BE A PART OF THIS AGREEMENT. TheOptimizer.io HAS COMPLETE DISCRETION TO UPDATE AND CHANGE THE SOFTWARE SERVICES AGREEMENT FROM TIME TO TIME AND TO CHANGE THE SCOPE OR FEATURES OF THE SOFTWARE SERVICES FROM TIME TO TIME. TheOptimizer.io MAY MAKE SUCH CHANGES WITHOUT NOTICE. IF YOU CONTINUE TO USE THE SOFTWARE SERVICES AFTER ANY SUCH CHANGES, WITH OR WITHOUT NOTICE, YOU WILL BE CONSIDERED TO HAVE CONSENTED TO THEM. 2.1. Customer Must Have Internet Access. DSL, cable or another high speed Internet connection is required for proper transmission of the Service. Customer is responsible for procuring and maintaining the network connections that connect the Customer network to the Service, including, but not limited to, “browser” software that supports protocol used by TheOptimizer.io, including Secure Socket Layer (SSL) protocol or other protocols accepted by TheOptimizer.io, and to follow logon procedures for services that support such protocols. TheOptimizer.io is not responsible for notifying Customer of any upgrades, fixes or enhancements to any such software, or for any compromise of data transmitted across computer networks or telecommunications facilities (including but not limited to the Internet) which are not owned or operated by TheOptimizer.io. TheOptimizer.io assumes no responsibility for the reliability or performance of any connections as described in this Section. 2.3. Users: Passwords, Access, And Notification. Customer shall authorize access to and assign unique passwords and user names. . User logins are for designated Users and cannot be shared or used by more than one User, but any User login may be reassigned to another User as needed. Customer will be responsible for the confidentiality and use of User’s passwords and user names. Customer will also be responsible for all Electronic Communications, including those containing business information, account registration, account holder information, financial information, Customer Data, and all other data of any kind contained within emails or otherwise entered electronically through the Service or under Customer’s account. TheOptimizer.io will act as though any Electronic Communications it receives under Customer’s passwords, user name, and/or account number will have been sent by Customer. Customer shall use commercially reasonable efforts to prevent unauthorized access to or use of the Service and shall promptly notify TheOptimizer.io of any unauthorized access or use of the Service and any loss or theft or unauthorized use of any User’s password or name and/or Service account numbers. The Service allows Customer to send Electronic Communications directly to TheOptimizer.io and to third parties. Customer shall comply with all applicable local, state, federal, and foreign laws, treaties, regulations, and conventions in connection with its use of the Service, including without limitation those related to privacy, electronic communications and anti-spam legislation. Customer is responsible for ensuring that its use of the Service to store or process credit card data complies with applicable Payment Card Industry Data Security Standards (“PCI DSS”) requirements and shall store credit card data only in the designated fields for such data. Customer shall comply with the export laws and regulations of the United States and other applicable jurisdictions in using the Service and obtain any permits, licenses and authorizations required for such compliance. Without limiting the foregoing, (i) Customer represents that it is not named on any U.S. government list of persons or entities prohibited from receiving exports, (ii) Customer shall not permit Users to access or use the Service in violation of any U.S. export embargo, prohibition or restriction, and (iii) Customer shall comply with all applicable laws regarding the transmission of technical data exported from the United States and the country in which its Users are located. Customer will not send any Electronic Communication from the Service that is unlawful, harassing, libelous, defamatory or threatening. Except as permitted by this Agreement, no part of the Service may be copied, reproduced, distributed, republished, displayed, posted or transmitted in any form or by any means. Customer agrees not to access the Service by any means other than through the interfaces that are provided by TheOptimizer.io. Customer shall not do any “mirroring” or “framing” of any part of the Service, or create Internet links to the Service which include log-in information, user names, passwords, and/or secure cookies. Customer will not in any way express or imply that any opinions contained in Customer’s Electronic Communications are endorsed by TheOptimizer.io. Customer shall ensure that all access and use of the Service by Users is in accordance with the terms and conditions of this Agreement, including but not limited to those Users that are contractors and agents, and Customer’s Affiliates. Any action or breach by any of such contractors, agents or Affiliates shall be deemed an action or breach by Customer and Customer waives all of those defenses that Customer may have as to why Customer should not be liable for Customer’s contractors’, agents’ or Affiliates’ acts, omissions and noncompliance with this Agreement. 2.5. Non Compete ; Your Representations. You represent and warrant that you or any of your affiliate companies are not a competitor of TheOptimizer.io and you are not using the Service and/or Licensed Program to engage in, or permit others to engage in competition with TheOptimizer.io. You represent and warrant that: (i) you examined the Service and/or Licensed Program and found it suitable to your needs; (ii) you are aware of and acknowledge the capabilities and limitations of the Service and/or Licensed Program; (iii) you have all permissions and licenses, including under any applicable corporate policies, confidentiality and non-competition agreements, to upload customer data to the Service and use it through the Service. Customer agrees that they (or any affiliates of customer’s company) will not develop a competing service to TheOptimizer.io and the Service during the term of this Agreement and for five years thereafter. Violation of this clause is grounds for immediate account termination by TheOptimizer.io with no liability on the part of TheOptimizer.io; TheOptimizer.io may seek equitable relief to stop the violation and competing activity as well as any other relief available under the law. Customer and their affiliated companies understand and agree that during the term of the Agreement, and for five (5) years after the last date of Customer using the Application or any service made available by TheOptimizer.io, Customer and its affiliated companies will not create, develop, sell, offer or distribute a Competing Service. A “Competing Service” is defined as software as a service that provides a creative, ad, or campaign creation software system with analytics and automation rules for optimization for content discovery networks such as Outbrain, Taboola, Revcontent, ContentAD, MGID or other content discovery networks distributing in the form of Native Ads as defined by the IAB. Customer understands and agrees that violation of this clause will be grounds for immediate termination of the Agreement without liability on the part of TheOptimizer.io. No assignment or Resale. You may not resell, assign, or transfer any of your rights under this Agreement, and if you attempt to resell, assign, or transfer its rights, TheOptimizer.io may immediately terminate this Agreement without liability to TheOptimizer.io. Customer understands that the technical processing and transmission of Customer’s Electronic Communications is fundamentally necessary to use of the Service. Customer expressly consents to TheOptimizer.io’s interception and storage of Electronic Communications and/or Customer Data, and Customer acknowledges and understands that Customer’s Electronic Communications will involve transmission over the Internet, and over various networks, only part of which may be owned and/or operated by TheOptimizer.io. Customer further acknowledges and understands that Electronic Communications may be accessed by unauthorized parties when communicated across the Internet, network communications facilities, telephone or other electronic means. Customer agrees that it is responsible for maintaining and protecting backups of all Customer Data and is responsible for the failure to store, the loss, or the corruption of Customer Data. Customer agrees that TheOptimizer.io and its affiliated entities will collect and track technical and related information about Customer and Customer’s use of the Software Services, including Customer’s internet protocol address, the hardware and software that Customer utilizes, and various usage statistics to assist with the necessary operation and function of the Software Services and for internal purposes only, including without limitation to facilitate in the provision of updates, support, invoicing, marketing by TheOptimizer.io, its affiliated entities, or its agents, and research and development. In the event that TheOptimizer.io is required or ordered to disclose Client Data to a third party pursuant to judicial order or other compulsion of law, if legally permitted, TheOptimizer.io shall take all commercially reasonable steps to provide the Customer with prompt notice of any relevant order or basis for disclosure so as to allow TheOptimizer.io is not responsible for any Electronic Communications and/or Customer Data which are delayed, lost, altered, intercepted or stored during the transmission of any data whatsoever across networks not owned and/or operated by TheOptimizer.io, including, but not limited to, the Internet and Customer’s local network. During the Term, the TheOptimizer.io Service will meet the service level specified in the “Service Level Commitment” listed on Schedule I hereto, which is hereby incorporated by reference. If the applicable Service fails to achieve the service level, then Customer will be entitled, as its sole and exclusive remedy, to a credit for the applicable Service in accordance with the terms set forth in the Service Level Commitment. The respective Service’s system logs and other records shall be used for calculating any service level events. As part of the Service, TheOptimizer.io will provide Customer with Help Documentation and other online resources to assist Customer in its use of the Service. Customer acknowledges that TheOptimizer.io has extensive experience helping Customers improve utilization and realization of benefits of the Service, and that not following the advice of TheOptimizer.io may substantially limit Customer’s ability to successfully utilize the Service or to enjoy the power and potential of the Service. TheOptimizer.io shall maintain reasonable administrative, physical and technical safeguards for the protection, confidentiality and integrity of Customer Data. For purposes of this Agreement, “Confidential Information” means any information disclosed by either party to the other party, either directly or indirectly, in writing, orally, or by inspection of tangible objects (i) that the disclosing party identifies as confidential or proprietary or (ii) Software Services and shall include the terms of this Agreement, Customer Data, each party’s proprietary technology, business processes and technical product information, designs, issues, all communication between the Parties regarding the Service and any information that is clearly identified in writing at the time of disclosure as confidential. Notwithstanding the foregoing, Confidential Information shall not include information which: (1) is known publicly; (2) is generally known in the industry before disclosure; (3) has become known publicly, without fault of the Receiving Party; (4) the Receiving Party becomes aware of from a third party not bound by non-disclosure obligations to the Disclosing Party and with the lawful right to disclose such information to the Receiving Party; or (5) is aggregate data regarding use of TheOptimizer.io products and services that does not contain any personally identifiable or Customer-specific information. Each party agrees: (a) to keep confidential all Confidential Information; (b) not to use or disclose Confidential Information except to the extent necessary to perform its obligations or exercise rights under this Agreement or as directed by Customer; (c) to protect the confidentiality thereof in the same manner as it protects the confidentiality of similar information and data of its own (at all times exercising at least a reasonable degree of care in the protection of such Confidential Information, including but not limited to inputting credit card data only in the fields designated for such data in the Service) and to make Confidential Information available to authorized persons only on a “need to know” basis. Either party may disclose Confidential Information on a need to know basis to its contractors and service providers who have executed written agreements requiring them to maintain such information in strict confidence and use it only to facilitate the performance of their services in connection with the performance of this Agreement. Notwithstanding the foregoing, this Section will not prohibit the disclosure of Confidential Information to the extent that such disclosure is permitted by law or order of a court or other governmental authority or regulation. The parties agree that any material breach of Section 2.2, 2.5 and this Section will cause irreparable injury and that injunctive relief in a court of competent jurisdiction will be appropriate to prevent an initial or continuing breach of these Sections in addition to any other relief to the applicable party may be entitled. 2.11. Ownership of Customer Data. As between TheOptimizer.io and Customer, all title and intellectual property rights in and to the Customer Data is owned exclusively by Customer. It is also noted that TheOptimizer.io has the authority to use Customer’s Data in the aggregate and for internal purposes only. Customer acknowledges and agrees that in connection with Service, TheOptimizer.io as part of its standard Service offering makes daily backup copies of the Customer Data in Customer’s account and stores and maintains such data for a period of time consistent with TheOptimizer.io standard business processes, which period shall not be less than one year. 2.12. TheOptimizer.io Intellectual Property Rights. The Software Services are licensed, not sold. Use herein of the word “purchase” in conjunction with licenses of the Software Services shall not imply a transfer of ownership.Customer agrees that all rights, title and interest in and to all intellectual property rights in the Service are owned exclusively by TheOptimizer.io or its licensors. Except as provided in this Agreement, the license granted to Customer does not convey any rights in the Service, express or implied, or ownership in the Service or any intellectual property rights thereto. In addition, TheOptimizer.io shall have a royalty-free, worldwide, transferable, sub-licensable, irrevocable, and perpetual license to use or incorporate into the Service any suggestions, enhancement requests, recommendations or other feedback provided by Customer, including users, relating to the operation of the Service. Any rights not expressly granted herein are reserved by TheOptimizer.io. TheOptimizer.io service marks, logos and product and service names are marks of TheOptimizer.io, respectively (the “TheOptimizer.io Marks”). Customer agrees not to display or use the TheOptimizer.io Marks in any manner without TheOptimizer.io’s express prior written permission. The trademarks, logos and service marks of Third Party Application providers (“Marks”) are the property of such third parties. Customer is not permitted to use these Marks without the prior written consent of such third party which may own the Mark. Each party agrees that before it or any employee, agent or representative of the party files a claim or suit with a federal or state agency or court or other public forum, it shall provide thirty (30) days prior written notice to the other and that, within such thirty (30) day period (or longer, if extended by mutual desire of the parties), authorized representatives of the parties shall meet (or confer by telephone) at least once in a good faith attempt to resolve the perceived dispute. TheOptimizer.io warrants that (i) the Service will achieve in all material respects the functionality described in the Help Documentation applicable to the Service procured by Customer, and (ii) such functionality of the Service will not be materially decreased during the Term. Customer’s sole and exclusive remedy for TheOptimizer.io’s breach of this warranty shall be that TheOptimizer.io shall be required to use commercially reasonable efforts to modify the Service to achieve in all material respects the functionality described in the Help Documentation and if TheOptimizer.io is unable to restore such functionality, Customer shall be entitled to terminate the Agreement and receive a pro-rata refund of the subscription fees paid under the Agreement for its use of the Service for the terminated portion of the Term. TheOptimizer.io shall have no obligation with respect to a warranty claim unless notified of such claim within thirty (30) days of the first instance of any material functionality problem, and such notice must be sent to [email protected] The warranties set forth in this Section 3.1 are made to and for the benefit of Customer only. Such warranties shall only apply if the applicable Service has been utilized in accordance with the Help Documentation, this Agreement and applicable law. TheOptimizer.io warrants that the Service will be free of viruses, Trojan horses, worms, spyware, or other such malicious code (“Malicious Code”), except for any Malicious Code contained in Customer-uploaded attachments or otherwise originating from Customer. EXCEPT AS STATED IN SECTION 3 ABOVE, TheOptimizer.io DOES NOT REPRESENT THAT CUSTOMER’S USE OF THE SERVICE WILL BE SECURE, TIMELY, UNINTERRUPTED OR ERROR-FREE OR THAT THE SERVICE WILL MEET CUSTOMER’S REQUIREMENTS OR THAT ALL ERRORS IN THE SERVICE AND/OR DOCUMENTATION WILL BE CORRECTED OR THAT THE OVERALL SYSTEM THAT MAKES THE SERVICE AVAILABLE (INCLUDING BUT NOT LIMITED TO THE INTERNET, OTHER TRANSMISSION NETWORKS, AND CUSTOMER’S LOCAL NETWORK AND EQUIPMENT) WILL BE FREE OF VIRUSES OR OTHER HARMFUL COMPONENTS. THE WARRANTIES STATED IN SECTION 3 ABOVE ARE THE SOLE AND EXCLUSIVE WARRANTIES OFFERED BY TheOptimizer.io. THERE ARE NO OTHER WARRANTIES OR CONDITIONS, EXPRESS OR IMPLIED, INCLUDING WITHOUT LIMITATION, THOSE OF MERCHANTABILITY, SATISFACTORY QUALITY, FITNESS FOR A PARTICULAR PURPOSE OR NON-INFRINGEMENT OF THIRD PARTY RIGHTS. EXCEPT AS STATED IN SECTIONS 2.7, 3.1, and 3.2 ABOVE, THE SERVICE IS PROVIDED TO CUSTOMER ON AN “AS IS” AND “AS AVAILABLE” BASIS, AND IS FOR COMMERCIAL USE ONLY. CUSTOMER ASSUMES ALL RESPONSIBILITY FOR DETERMINING WHETHER THE SERVICE OR THE INFORMATION GENERATED THEREBY IS ACCURATE OR SUFFICIENT FOR CUSTOMER’S PURPOSES. CUSTOMER AGREES THAT THE CONSIDERATION WHICH TheOptimizer.io IS CHARGING HEREUNDER DOES NOT INCLUDE CONSIDERATION FOR ASSUMPTION BY TheOptimizer.io OF THE RISK OF CUSTOMER’S INCIDENTAL OR CONSEQUENTIAL DAMAGES. IN NO EVENT SHALL EITHER PARTY BE LIABLE TO ANYONE FOR LOST PROFITS OR REVENUE OR FOR INCIDENTAL, CONSEQUENTIAL, PUNITIVE, COVER, SPECIAL, RELIANCE OR EXEMPLARY DAMAGES, OR INDIRECT DAMAGES OF ANY TYPE OR KIND HOWEVER CAUSED, WHETHER FROM BREACH OF WARRANTY, BREACH OR REPUDIATION OF CONTRACT, NEGLIGENCE, OR ANY OTHER LEGAL CAUSE OF ACTION FROM OR IN CONNECTION WITH THIS AGREEMENT (AND WHETHER OR NOT THE PARTY HAS BEEN ADVISED OF THE POSSIBILITY OF SUCH DAMAGES TO THE MAXIMUM EXTENT PERMITTED BY LAW) OR OTHERWISE SHALL IN NO EVENT EXCEED THE DIRECT DAMAGE LIMITATIONS AS SET FORTH IN SECTION 5. Except with regard to amounts due under this Agreement, and a party’s breach of Section 2.10 (Confidential Information), the maximum liability of either party to any person, firm or corporation whatsoever arising out of or in the connection with any license, use or other employment of the Service, whether such liability arises from any claim based on breach or repudiation of contract, breach of warranty, negligence, tort, statutory duty, or otherwise, shall in no case exceed the equivalent of 12 months in subscription fees applicable at the time of the event, and in the event of a breach of Section 2.10 (Confidential Information) of this Terms of Service, such maximum liability of either party shall be an amount equal to one (1) times the equivalent of 12 months of subscription fees applicable at the time of the event. Notwithstanding the previous sentence, neither party shall be liable to the other party to the extent such liability would not have occurred but for the other party’s failure to comply with the terms of this Agreement The essential purpose of this provision is to limit the potential liability of the parties arising from this Agreement. The parties acknowledge that the limitations set forth in this Section are integral to the amount of fees charged in connection with making the Service available to Customer and that, were TheOptimizer.io to assume any further liability other than as set forth herein, such fees would of necessity be set substantially higher. THE LIMITATIONS OF LIABILITY SET FORTH IN THIS SECTION SHALL NOT APPLY TO EITHER PARTY’S INDEMNITY OBLIGATIONS EXCEPT AS SET FORTH IN SECTION 6 BELOW. Certain states and/or jurisdictions do not allow the exclusion of implied warranties or limitations of liability for incidental or consequential damages, so the exclusions set forth above may not apply to Customer. Excluded from the above indemnification obligations are Claims to the extent arising from (a) use of the Service in violation of this Agreement or applicable law, (b) use of the Service after TheOptimizer.io notifies Customer to discontinue use because of an infringement claim, (c) modifications to the Service not made by TheOptimizer.io, or (d) use of the Service in combination with any software, application or service made or provided other than by TheOptimizer.io. If a Claim is brought or threatened, TheOptimizer.io shall, at its sole option and expense, use commercially reasonable efforts either (a) to procure a license that will protect Customer against such Claim without cost to Customer; (b) to modify or replace all or portions of the Service as needed to avoid infringement, such update or replacement having substantially similar or better capabilities; or (c) if (a) and (b) are not commercially feasible, terminate the Agreement and refund to the Customer a pro-rata refund of the subscription fees paid for under the Agreement for the terminated portion of the Term. The rights and remedies granted Customer under this Section 6.1 state TheOptimizer.io’s entire liability, and Customer’s exclusive remedy, with respect to any claim of infringement of the intellectual property rights of a third party. TheOptimizer.io shall, at its own expense and subject to the limitations set forth in this Section 6, defend Customer from and against any Claims that arise out of or result directly from TheOptimizer.io’s gross negligence or willful misconduct in preventing unauthorized access to confidential Customer Data, as determined by a court of competent jurisdiction in connection with a Claim alleging a breach of confidentiality, and shall hold Customer harmless from and against liability for any Losses to the extent based upon such Claims. When TheOptimizer.io is at fault but such fault does not rise to the level of gross negligence or willful misconduct, TheOptimizer.io shall, at its own expense and subject to the limitations set forth in this Section 6 and the amount of liability set forth in Section 5 applicable in the event of a breach of Section 2.10, defend Customer from and against any Claims, and shall hold Customer harmless from and against liability for any Losses to the extent based upon Claims, arising out of or relating to TheOptimizer.io’s breach of Section 2.10 (Confidential Information) of this Terms of Service. Provided that TheOptimizer.io complies with this Section 6.2, Customer shall be entitled as its sole and exclusive remedy to terminate the Agreement and receive a pro-rata refund of the subscription fees paid for under the Agreement for the terminated portion of the Term. Customer shall, at its own expense and subject to the limitations set forth in this Section 6, defend TheOptimizer.io from and against any and all Claims (i) alleging that the Customer Data or any trademarks or service marks other than TheOptimizer.io Marks, or any use thereof, infringes the intellectual property rights or other rights, or has caused harm to a third party, or (ii) arising out of Customer’s breach of Section 2.4 (Customer’s Lawful Conduct) or 2.10 (Confidential Information) above and shall hold TheOptimizer.io harmless from and against liability for any Losses to the extent based upon such Claims. 6.4. Indemnification Procedures and Survival. In the event of a potential indemnity obligation under this Section 6, the indemnified party shall: (i) promptly notify the indemnifying party in writing of such Claim; (ii) allow the indemnifying party to have sole control of its defense and settlement; and (iii) upon request of the indemnifying party, cooperate in all reasonable respects, at the indemnifying party’s cost and expense, with the indemnifying party in the investigation, trial, and defense of such Claim and any appeal arising therefrom. The indemnification obligations under this Section 6 are expressly conditioned upon the indemnified party’s compliance with this Section 6.4 except that failure to notify the indemnifying party of such Claim shall not relieve that party of its obligations under this Section 6 but such Claim shall be reduced to the extent of any damages attributable to such failure. The indemnification obligations contained in this Section 6 shall survive termination of this Agreement for one year. 7.1. Suspension for Delinquent Account. TheOptimizer.io reserves the right to suspend Customer’s and any Customer Affiliates’ access to and/or use of the Service for any accounts (i) for which any payment is due but unpaid, or (ii) for which Customer has not paid for the automatic renewal term and has not notified TheOptimizer.io of its desire to cancel the Service by the End Date of the then current term. The suspension is for the entire account and Customer understands that such suspension would therefore include Affiliate sub-accounts. Customer agrees that TheOptimizer.io shall not be liable to Customer or to any Customer Affiliate or other third party for any suspension of the Service pursuant to this Section 7.1. 7.2. Suspension for Ongoing Harm. Customer agrees that TheOptimizer.io may with reasonably electronic mail or contemporaneous telephonic notice to Customer suspend access to the Service if TheOptimizer.io reasonably concludes that Customer’s Service is being used to engage in denial of service attacks, spamming, or illegal activity, and/or use of Customer’s Service is causing immediate, material and ongoing harm to TheOptimizer.io or others. 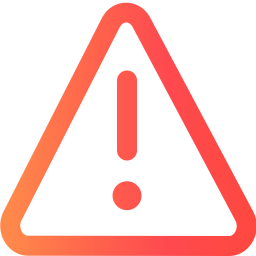 In the extraordinary event that TheOptimizer.io suspends Customer’s access to the Service, TheOptimizer.io will use commercially reasonable efforts to limit the suspension to the offending portion of the Service and resolve the issues causing the suspension of Service. Customer further agrees that TheOptimizer.io shall not be liable to Customer nor to any third party for any suspension of the Service under such circumstances as described in this Section 7.2. 7.3. Termination for Cause, Expiration. Either party may immediately terminate this Agreement and all Orders issued hereunder in the event the other party commits a material breach of any provision of this Agreement which is not cured within thirty (30) days of written notice from the non-breaching party. Such notice by the complaining party shall expressly state all of the reasons for the claimed breach in sufficient detail so as to provide the alleged breaching party a meaningful opportunity to cure such alleged breach and shall be sent to the General Counsel of the alleged breaching party at the address listed in the heading of this Agreement (or such other address that may be provided pursuant to this Agreement) (“Notice”). Upon termination or expiration of this Agreement, Customer shall have no rights to continue use of the Service. If this Agreement is terminated by Customer for any reason other than a termination expressly permitted by this Agreement, then TheOptimizer.io shall be entitled to all of the fees due under this Agreement for the entire Term. If this Agreement is terminated as a result of TheOptimizer.io’s breach of this Agreement, then Customer shall not be entitled to a monetary refund but shall have access to the software until the end of the term. 7.4. Handling of Customer Data In The Event Of Termination. Customer agrees that following termination of Customer’s account and/or use of the Service, TheOptimizer.io may immediately deactivate Customer’s account and that following a reasonable period of not less than 30 days shall be entitled to delete Customer’s account from TheOptimizer.io’s “live” site, provided that Customer has paid in full all good faith undisputed amounts owed to TheOptimizer.io. Customer further agrees that TheOptimizer.io shall not be liable to Customer nor to any third party for any termination of Customer access to the Service or deletion of Customer Data, provided that TheOptimizer.io is in compliance with the terms of this Section 7.4. 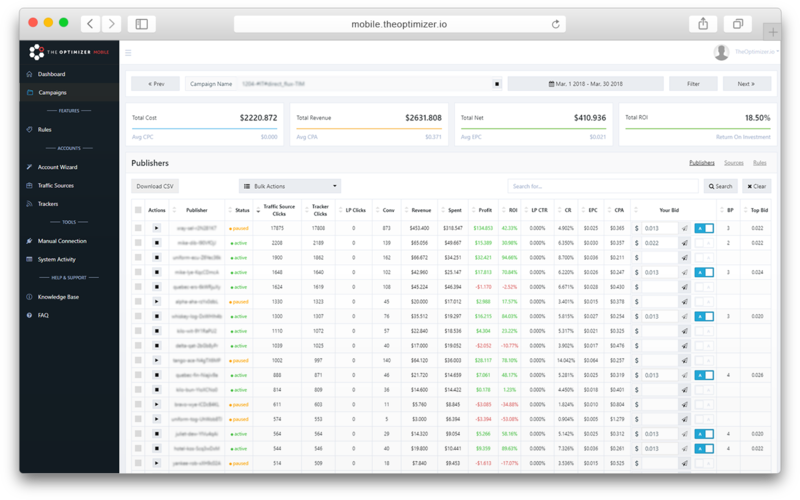 TheOptimizer.io may make modifications to the Service or particular components of the Service from time to time and will use commercially reasonable efforts to notify Customer of any material modifications. TheOptimizer.io reserves the right to discontinue offering the Service at the conclusion of Customer’s then current Term. TheOptimizer.io shall not be liable to Customer nor to any third party for any modification of the Service as described in this Section 8.1. 9.1 Relationship of the Parties. The parties are independent contractors. This Agreement does not create a partnership, franchise, joint venture, agency, fiduciary or employment relationship between the parties. Nothing in this Agreement creates an exclusive relationship or in any way prevents TheOptimizer.io from entering into similar arrangements with or providing similar services to other entities, including, without limitation, other similar customers. Client understands and acknowledges that TheOptimizer.io is free to use some or all of the data, information, techniques, methodologies, forms, layouts or results of any of the products or services provided by TheOptimizer.io hereunder in providing products or services to other customers and nothing in this Agreement shall be construed to limit TheOptimizer.io’s right to do so. If the Client uses any third party service with the Software Services (including services that may use any application programming interface (API) provided by TheOptimizer.io), the Client acknowledges that the third party service may access or use the customer’s information. TheOptimizer.io will not be responsible for any act or omission of the third party, including such third party’s use of the customer’s information. The Client agrees to contact the third party service provider for any issues arising from the Client’s use of the third party service. 9.3 Compliance with Applicable Laws. The Software Services are protected by intellectual property laws and other laws of the United States and international laws and treaties, including intellectual property and export laws. Client agrees that it shall use the Software Services and shall perform all obligations under this Agreement in a manner that complies with all applicable laws applicable to Client and its use of the Software Services and published documentation, including, but not limited to, any and all contractual, statutory, or common law rights and obligations and applicable restrictions concerning intellectual property rights. Client agrees that it shall abide by all applicable export control laws, rules and regulations applicable to its use of the Software Services. No failure or delay by either party in exercising any right under this Agreement shall constitute a waiver of that right. The waiver of any breach or provision of this Agreement will not be deemed a waiver of any different or subsequent breach. The provisions of this Agreement are severable. In the event that any provision or portion thereof is found by any court to be invalid or otherwise unenforceable, the remainder of this Agreement will not be affected, and the parties consent to such court’s substitution of a valid and enforceable term that approximates the intent and effect of such invalid or unenforceable provision or portion. “Affiliates” means any entity which directly or indirectly, through one or more intermediaries, controls, or is controlled by, or is under common control with Customer, by way of majority voting stock ownership or the ability to otherwise direct or cause the direction of the management and policies of Customer. “Customer Data” means all electronic data or information submitted to the Service by Customer or its Affiliates. “Electronic Communications” means any transfer of signs, signals, text, images, sounds, data or intelligence of any nature transmitted in whole or part electronically received and/or transmitted through the Service. “Order Form” means a TheOptimizer.io renewal notification or order form in the name of and executed by Customer or its Affiliate and accepted by TheOptimizer.io which specifies the Service and implementation services to be provided by TheOptimizer.io subject to the terms of this Agreement. “Help Documentation” means the online help center documentation describing the Service features, including User Guides which may be updated from time to time. “Service” collectively, TheOptimizer.io’s online business application suite (the “TheOptimizer.io Service”) as described in the applicable Help Documentation that is procured by Customer from TheOptimizer.io in the Order Form and any subsequent Order Form from time to time, including associated offline components, but excluding Third Party Applications and implementation services. “Third Party Applications” means online, Web-based applications or services and offline software products that are provided by third parties, and interoperate with the Service. “Users” means individuals who are authorized by Customer to use the Service, for whom subscriptions to a Service have been procured, and who have been supplied user identifications and passwords by Customer (or by TheOptimizer.io at Customer’s request). Users may include but are not limited to Customer’s and Customer’s Affiliates’ employees, consultants, contractors and agents. “User Guides” means the online user guides for the Service, accessible at http://TheOptimizer.io/help, as updated from time to time. Customer acknowledges that it has had the opportunity to review the User Guide. “URL Terms” means the terms with which Customer must comply, which are located at a URL and referenced in this Agreement. TheOptimizer.io commits to provide 99% uptime with respect to the Customer’s Service during each month of the Term, excluding regularly scheduled maintenance times. If in any month this uptime commitment is not met by TheOptimizer.io and Customer was negatively impacted (i.e., attempted to log into or access the Service and failed due to the unscheduled downtime of the Service), TheOptimizer.io shall provide, as the sole and exclusive remedy, a service credit equal to one month’s fee for the use of the Service. Regularly scheduled maintenance time does not count as downtime. Maintenance time is regularly scheduled if it is communicated in accordance with the notice section set forth below at least two full business days in advance of the maintenance time. TheOptimizer.io hereby provides notice that every Monday morning 7:00am – 10:00am UTC is reserved for routine scheduled maintenance for use as needed. TheOptimizer.io in its sole discretion may take the Service down for unscheduled maintenance and in that event will attempt to notify customer in advance in accordance with the Notice section set forth below. Such unscheduled maintenance will be counted against the uptime guarantee. In order to receive a credit under this service level commitment, Customer must request it simply by emailing TheOptimizer.io at [email protected], within five days of the end of the applicable month. If Customer submits a credit request and does not receive a prompt automated response indicating that the request was received, Customer must resubmit the request because the submission was not properly received and will not result in a credit. Customers who are past due or in default with respect to any payment or any material contractual obligations to TheOptimizer.io are not eligible for any credit under this Service Level Commitment. The service credit is valid for up to one year from the month for which the credit was issued. TheOptimizer.io shall calculate any service level downtime using TheOptimizer.io’s system logs and other records. This Service Level Commitment may be amended by TheOptimizer.io in its discretion but only after providing thirty days advance notice. Notices will be sufficient if provided to a user designated as an administrator of your TheOptimizer.io account either: (a) as a note on the screen presented immediately after completion of the log in authentication credentials at the log in screen, or (b) by email to the registered email address provided for the administrator(s) for Customer’s account. TheOptimizer.io Sandbox, Beta and debugger accounts and other test environments are expressly excluded from this or any other service level commitment. We realise that not every member who signs up to our platform will be in the right stage of their life or career to fully benefit from the membership. So, we have a 15 free days trial to test the system and decide if it fits your needs. During the first 15 days you can cancel anytime and without any charges or obbligations. After that period, no refunds will be given. We think 15 days is long enough to decide if you want to keep using the platform. If you do need a refund, for any reason not covered above,please use the support ticket function found within in our site.